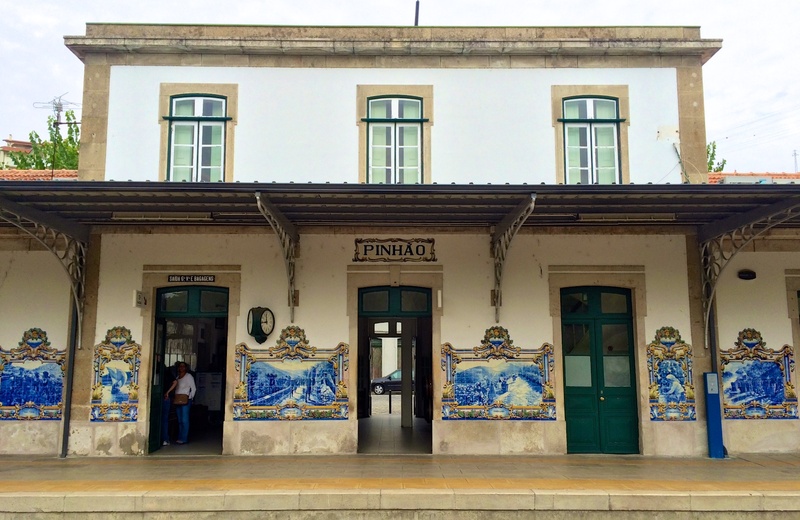 The train ride into the Douro valley from Porto is thought to be one of the best train routes in the world…. more specifically, the section that runs from the interior town of Regua to the town of Tua, which runs alongside the Rio Douro. As our train chugs along the tracks through the valley, further toward the interior, we’re so close to the bank, it’s almost as if we’re gliding along the water. Steep hills line both sides of the calm river, the slopes lined with terraced vineyards, which is the landscape that the Douro valley is most famous for. After arriving in the small Douro town of Pinhão, we walked up to the nearby Quinta do Bomfim to learn more about the history of this ancient valley, as well as the process of winemaking here in the region. Quinta do Bomfim is a family run estate, currently operating under the 4th generation of the Symington family, with the 5th generation already working in the business. They hold title to many brands of wine and port, including the popular Graham’s, Dow’s, and others. It’s history goes back over 200 years, to the late 1700s, with its real genesis in the mid-1800s during the big port wine boom, when Andrew Symington took over full control of the company. Port greatly owes its popularity due to the war between the British and the French. 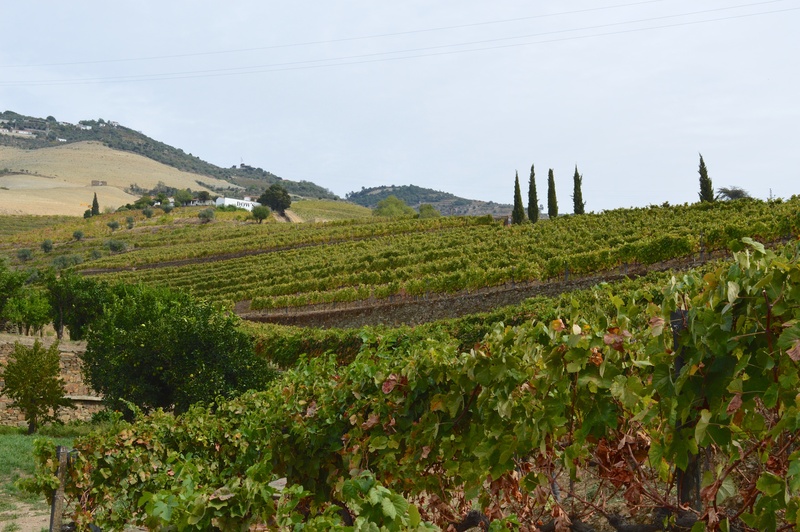 The Brits used to get the majority of their wines from France, but when they went to war, they had to turn elsewhere, finding Portugal’s Douro valley vineyards. 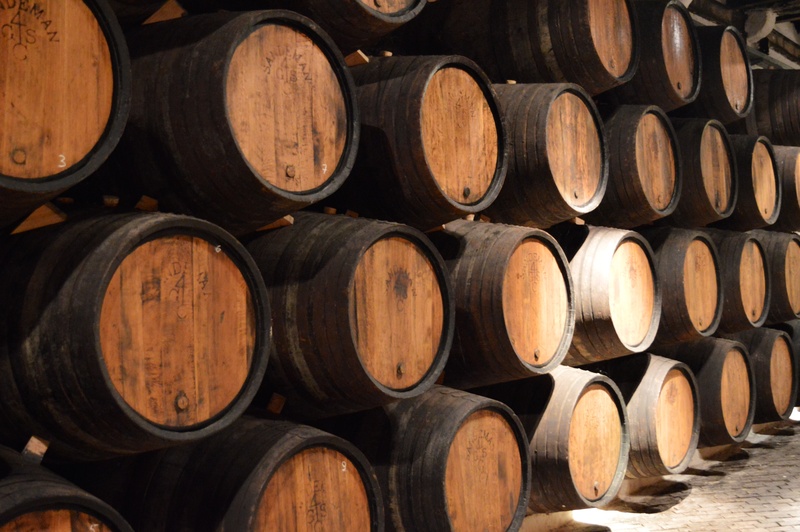 The only problem was that Portuguese wine couldn’t survive the long boat journey back to England, so it was fortified with the use of additional spirits (usually a brandy), to stop the fermentation process and allowing it to last for long periods of time without going bad. Thus, port wine was born. At the Sandeman cellar in Vila Nova da Gaia, we learned about the aging process of port, but here at Quinta do Bomfim, we learn about the growing methods of the grapes, as well as the fermentation process that’s used before the wines are shipped to Gaia for aging. It was explained to us that the reason that the aging takes place in Gaia, and not at the quintas, is because the more coastal location of Gaia/Porto provides a more stable temperature and humid climate for the wines. The Douro valley is quite dry, with a high precipitation level of about 800 cm of rain per year, and in some areas, a low of about 400 cm of rain per year. 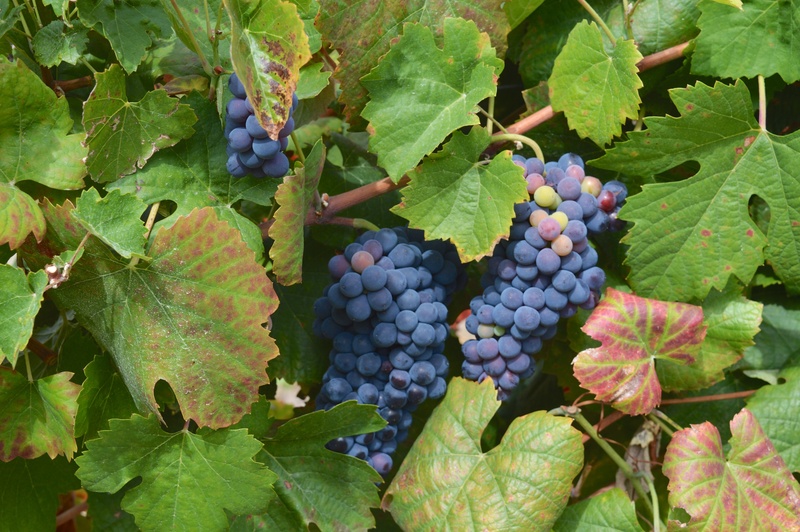 This means that the grape yield is lower than in regions such as France or Italy, but the quality of the grapes is unique. Due to the dryness and lower yield, the grapes generally have a much higher sugar content, which lends well to the production of port wine. Shist (known as slate in North America), is an extremely important element in the growing process in the Douro. This rock is found all over the Douro, and actually can be found all over Portugal. Without shist rock, grape vines likely wouldn’t be grown at all. The quintas use the shist to cover the ground at the base of the vines which provides a double use- the rock retains heat from the hot sun during the day, providing a stable heat source during the cold nights, which allows for only a small temperature fluctuation throughout the day and night. This allows the vines to mature continuously. Shist rock also shades the ground from the sun, retaining more of the water in the soil because of less evaporation. This is very important to growers, as they don’t use irrigation, because the soils are already so low in mineral and nutrient content, irrigation would wash out what precious nutrients do exist. The fermentation room on the Quinta grounds is modernized with stainless steel mechanical equipment, which became more of a necessity as they started producing larger volumes of wines. The stainless steel vats allow for easier temperature control, which overall, produces a higher quality wine. Currently, the company only has one vineyard that still uses the traditional stone vats and traditional foot stomping techniques. They do this, not only to honor the tradition of the historic wine-making region, but also because the traditional methods result in a variety of wine that can’t be reproduced by mechanical means. The stone vats release minerals into the wine which give it a uniquely complex profile. I found the modern mechanical stomping machines really interesting, because they’re engineered to mimic a human, outputting a pressure that mimics the weight of a 80kg man, and the temperature of the human body. Even the silicone pads on the bottom of the stomper are created to recreate the closest possible feel to human feet. After we toured the wine-making processes, we then had the opportunity to sit down to another tasting, which probably wasn’t needed after the previous day’s port adventure…. but hey, we’re in one of the oldest and best wine regions in the world, how could we not?! This time we tasted 3 wines and 3 ports, including a wine from the much celebrated 2011 vintage year. Being such an alcohol rookie, I never really thought I’d know much of a difference between various qualities of booze, but let me tell you… when you’re drinking the ‘good stuff’, it’s light years ahead of the lower grades. Sometimes you just gotta pony up for the higher priced items if you care about quality. Susete and I didn’t have anything to eat for the day yet, so we needed to walk off our wines after the tasting. The rebellious adventurers we are, we found a gate that was left open and headed off into the vineyards… alone, no other tourists, or even any people at all. This is how I like to travel and experience new things… uninterrupted. Hectares upon hectares of beautiful grape vines, sprawling up the slopes, organized into terraces, which allowed them to handle the steep grade. 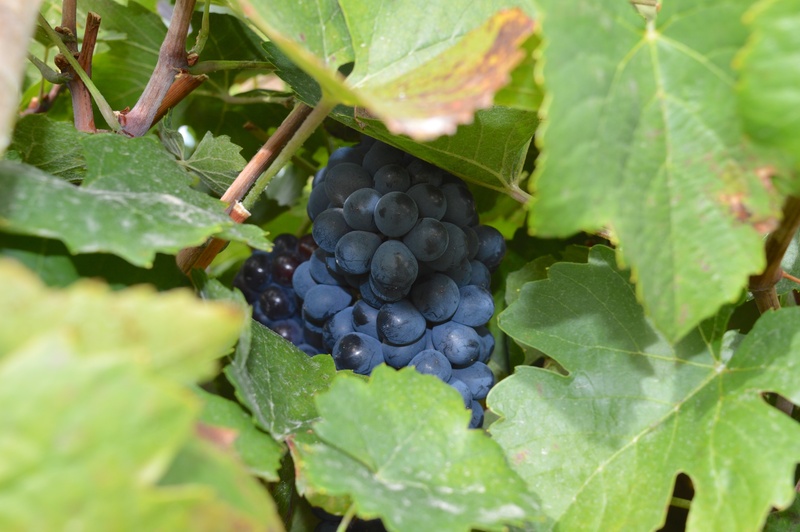 At first we were sad that the harvest had already taken place, but then we wandered into an area where the grapes were still on the vines, and managed to swipe a few to taste, and they were oh so good. We also found some olive trees that we sampled from, but that turned out to be a terrible idea. The bitter taste of unripened olives stayed in my mouth for the next 20 minutes. After an easy lunch at a local spot, we headed back on the next train home… winding our way through the beautiful valley landscape and back to Porto… another adventure under our belts.